For the reader who commented that my pieces on Cifonelli tend towards the emotional, I apologise in advance. This is a beautiful, beautiful coat, and one of the finest things I have ever worn. Right, that’s over. Down to details. 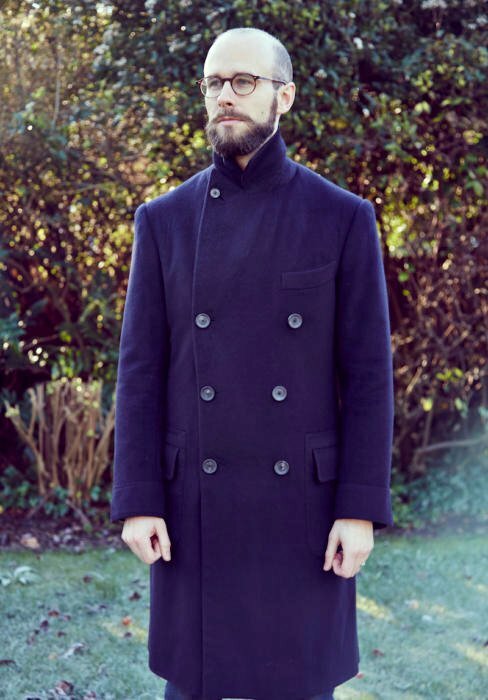 This is the navy cashmere overcoat I commissioned from Cifonelli at the end of the 2013. When it became clear that we were not going to finish it before the end of the winter, the project was put on hold until September 2014. It was finished in October, and I have been wearing in regularly every since. Readers will be familiar by now with the peerless work of Cifonelli, one of the finest bespoke tailors in the world. The fit, of course, is always spot on, and the bespoke make – hand-padded canvas, hand-made rope – we now take for granted. But the thing that always separates Cifonelli (and one or two other makers, such as Camps de Luca) is the hand-finishing. The Milanese buttonholes (below); the endless, pointless top stitching. That finishing deserves a post all of its own. And if readers will indulge me, perhaps I will write one (with some detailed photos). From the start, therefore, I made it clear to Lorenzo Cifonelli that this DB must work as well buttoned as un-. It must sit elegantly, smartly, with only the central two of the six buttons fastened. This is the normal, formal arrangement, with collar down. But when the collar is raised, the lapels (or revers) reversed, it must button at the top row of the six, and then again under the chin, creating a perfect, smooth shield against the elements (below). This style is not new, but it is hard to execute effectively, and it is to Lorenzo’s eternal credit that he managed to cut the front edge so that it encompassed all six buttons with collar raised, yet looked equally elegant with collar lowered. In fact, I realise now that I was so keen to demonstrate this point that I forgot to take any pictures of the coat with the collar down. One more reason for another post I suppose. The back of the coat has a fixed half belt, with pleats above and below – topped with the distinctive Cifonelli arrowhead, painstakingly hand-stitched. The smaller pleats to left and right frame the central cuts nicely. As with many overcoats, there is a compromise between cutting the shoulders to fit everything from a Chittleborough & Morgan suit to a sweater underneath. Lorenzo and I pitched this one right in the middle, and I elected to photograph it only wearing knitwear to show the effects of that compromise (above). You can see how the lack of suit shoulders causes the back to collapse slightly at the sides – but the compromise cut mitigates the effect. If it had been cut purely for a suit, the effect would have been much greater. Elsewhere, I went for patch, postbox pockets. 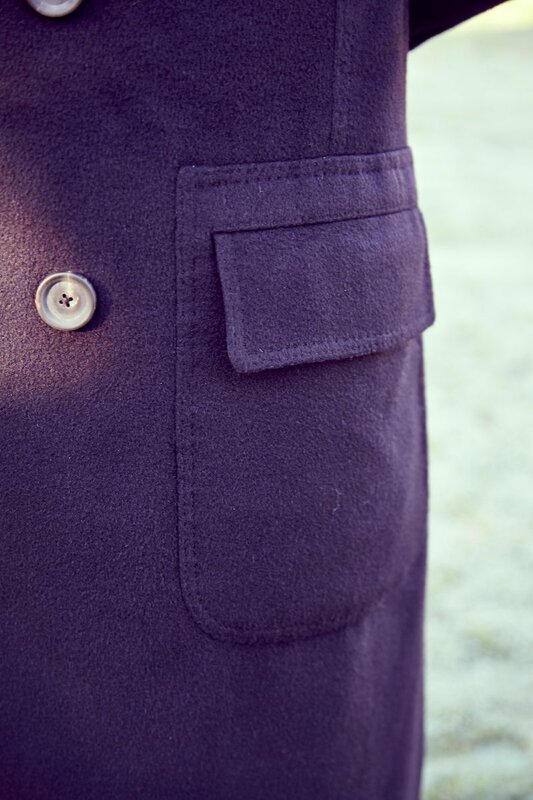 I like the casual look of patch pockets and the flap is cut to slip inside easily, allowing the pockets to be used for warming the hands without having to lift up the flap each time. The buttonholes are finely but very tightly stitched – necessary when all of them might be in regular use. And I am consistently impressed with how the Milanese buttonholes on the lapel retain their long, straight line, even when used to button under the chin. The dusted, dark-brown horn buttons are, naturally, Lorenzo’s particular design. Finally, a word must go to the fabulous cloth: 22oz cashmere from Harrison’s. Few people do decent weight cashmere overcoating any more – and most in the market are Loro Piana and a lot more expensive. You can follow the discussion on Cifonelli double-breasted overcoat by entering your email address in the box below. You will then receive an email every time a new comment is added. These will also contain a link to a page where you can stop the alerts, and remove all of your related data from the site. Not very keen on this, Simon. Thought I would be. So sorry! Can’t fault Cifonelli (apart from the weird button placement on the top row – unless that’s the camera angle?). Did you and Lorenzo disagree on anything at all stylistically? I’d disagree with always putting the collar up on a DB. A Greatcoat may be the answer to that problem. Or a warm scarf! Anyway, enjoy your new coat! Thanks, no need to apologise Mac! Buttons etc all the camera angle, yes. It works very well with collar down too, but I’ll take some other shots to show that. Important thing is it does both. Friends be glad to see the back of you in that coat .! The back pleats and styling are truly beautiful . Not keen on the postbox pockets at the front . Also I notice there is less of a silhouette affect from under the arm down to the waist. Very interested to learn that it was designed with a view to be worn both with suit jacket and without. Would you know of any ready to wear top/overcoats that work well both ways.? Also , I know it’s said that a ready to wear suit should always be taken to a tailor to alter to fit . Does the same go for ready to wear top/ over coats. The silhouette isn’t as sharp around the waist for the same reason – without a suit underneath, it isn’t filled out as much. Hard to give advice on coats that could be worn with knitwear and suits – it depends a lot on the cut and grading of the sizes. Certainly get overcoats altered. On most guys one that fits on the shoulders over a suit will be rather large in the waist. But I am not sure I’d agree with 18 oz cashmere being a decent weight for overcoating. Far too skimpy! Did you ever consider the London Lounge’s 1000g / 35oz navy cashmere? Now that is a “decent” weight for overcoats and something that in my mind would be far more deserving of Cifonelli’s beautiful tailoring than this skimpy cloth. Surprised you’re not smiling more Simon, it’s beautiful! One stylistic suggestion for your photos: I know you will often want formal still shots to get up close to show the details but if would also good to see action shots, to show how your commissions work and look as you move. Great cuts there Simon! May I ask how much such a coat from Cifonelli costs in round figures? Simon, regarding the shoulders collapsing (on an overcoat worn over knitwear), why don’t you just separate the formal from the casual? You must have a million overcoats! Knowing you, you’ve given this much consideration. Why not keep the formal overcoats for suits/jkts and wear knitwear/casual with your Pea coat or a raincoat etc? That said, I occasionally use a bespoke set of removable shoulder pads. It’s one kind of answer until I have more overcoats! Does that mean that neither ‘with jkt’ nor ‘without jkt’ fits quite right? You’ll have to convince me on that one, Simon ha! Nicely made all the same. Re: the request for showing clothes while in movement, or ‘real life’. The danger then is you would have a million armchair critics saying “oh there is a collar gap” or “the shoulder line isn’t smooth”…. Etc etc. Only professional models can really make the clothes look their best while in movement, as they know all the angles to pose in to show the clothes at their best. That’s why most sartorial blogs stick to the tried and tested Robocop poses. The fabric looks really nice. Simon, PLEASE write a post on the finishing featured on this jacket. My best hope of ever encountering a Cifonelli in real life is likely limited to passing by you on a London street someday. That said, living vicariously through your posts will have to see me through and I would really enjoy a more exacting examination of the skill displayed therein. I think the jacket is a thing of beauty and the back details- the pleating, the belt, the arrowhead- held me in awe. Thanks for sharing. Sorry to be off topic but I wanted to ask you a question on sleeve buttons. My tailor called me crazy for having the audacity to say remove them all. I see them as pointless visual clutter that takes a person’s eyes from my cufflinks. So instead of debating whether it’s pretentious or sprezzatura to show functional buttonholes, I just want to know why we still have MUST have sleeve buttons at all? No reason at all, up to you if you want to remove them all. It also shouldn’t be the end of the world to add them later. You’d have to open up the sleeve, but that’s not that hard. Hi Simon – I think I might have caught sight of you in this while you were cycling up Chancery Lane on a Boris bike. I imagine the pleats make it pretty versatile for that type of use? How should bespoke deal with imperfections? PS. Love the look of the coat even if I am not convinced by the colour. It depends a lot on the tailor – a structured English tailor, definitely; a Neapolitan, not at all. With shoes, yes more consistently. Hello Lee! I do too! I wonder where, in Canada, I can find such a garment or have it made. Thank you Simon – crisis averted! Regarding the overcoat, I will agree with the first poster Mac, in that I thought I would love this coat more. However, I keep clicking over to your gorgeous Loden coat from Vergallo…do you wear one more than the other? Once again, a good read. Question: have you ever come to the conclusion once having an item bespoke, that the fit/style/value improvement over the best of “off the rack” – with good alterations – did not justify the cost or effort? I mean this more as a category question, versus one – offs, such as your recent plaster shoe experience. Good question, but a very big one. Depends what counts as justifying it of course. Wonderful coat Simon. Do you prefer to button the lapel rather than wear a scarf wrapped in the opening? It does lend the coat a modern, functional look to it. Although i must admit I prefer the idea of filling that space with a scarf or shirt, tie and a scarf. You have excellent taste, Simon, and this coat is confirmation of my opinion. The craftsmanship is equally outstanding. Do they have a web site? Haha yes, thought that ball might be put back into my court. Beautiful coat Simon, beautiful. From the colour to construction to finishing and balance. Really like the postbox pockets – that’s character in combination with the ‘normal’ breast pocket. But then again, I just can’t seem to get over the fact the man seems to be a tailoring genius. Keep those (emotional) posts coming. The coat is nice but seems kind of lifeless compared to the jacket made for you by Gieves & Hawkes. This is a great feat of craftsmanship indeed! Also important is that this coat is definitely your signature and entry ticket to the world finest dandies’ club! After seing the pics of your peacoat designed and made by Gieves & Hawkes, I thought this guy is going to cross over the threshhold before our own eyes! This time around, you are definitely on the overside and … forever! Impressive piece ! The shape looks amazing – could we see pictures of coat worn in a classic way ? 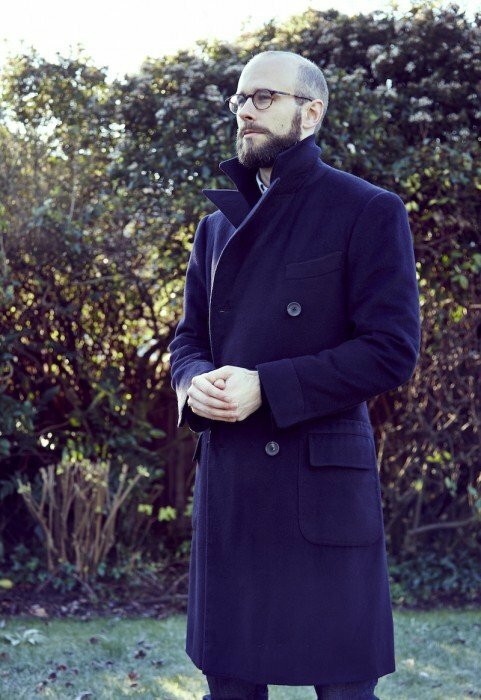 Simon, the fact that you’re very happy with the overcoat is exactly what keeps the bespoke trade alive. There are many charlatans trading as bespoke tailors who have little knowledge or skill. Some men try out a dodgy tailor, and give up on bespoke after one bad experience. Such a shame. When it’s done right (by the best craftsmen), it’s a whole different world! By the way, when’s your book out? More info please. At the moment, should be at least two out this year – a Permanent Style Annual, hopefully, in the next couple of months, and the Thames & Hudson book ‘True Luxury’ in November. Might also be one more. Haha yes, thought that ball might be put back into my court. Beautiful coat Simon, beautiful – fully deserves every bit of emotion, as always. From the colour to construction to finishing and balance. Really like the postbox pockets – that’s character in combination with the ‘normal’ breast pocket. But then again, I just can’t seem to get over the fact the man seems to be a tailoring genius. Keep those passionate posts coming. Congratulations on your coat. It looks a little on the short side to my taste, but since there are no full body photos it is admittedly difficult to dispense any final judgement. I am surprised that the price difference between Cifonelli’s suits and overcoats is not greater, especially given that this coat was made with cashmere. Anyway, a point on buttonholes: I realize that the asola lucida or glossy buttonhole is commonly called boutonnière Milanaise in France (well, in Paris anyway), but I think the term is misleading in its geographical connotations. According to people such as Jeff Diduch, the Parisian term is actually referring to the specific brand of gimp that was used for making this style of buttonholes and not the city. My (Milanese) tailor tells me that the buttonhole techinique practiced by Cifonelli certainly has little to do with the asola lucida techinique of Milanese tradition. He informs me that techniques vary across Italy and specifically distinguishes the Milanese technique from the Roman. The result of this variation is, apparently, the degree of glossiness, for better or worse I suppose. Cifonelli’s buttonholes are of the Roman variety but with a French twist. This comment may rightfully be viewed as technical pendantry, however, the prevalence of the term ‘Milanese buttonhole’ does annoy me, so there you are. Thanks. You’re right, it is nothing to do with Milan, but with the name of the gimp. Simon, must say I wouldn’t wear ever dare wear such a special piece as this on a bike! What’s your attitude to rain, etc damaging it? would it be fruitful to have a more comprenhensive guide on “how to care for your cashemere overcoat” or those general guidelines are enough? I think those plus out videos on caring for tailoring are probably sufficient. You are a fortunate fellow. I have a weakness for DB overcoats and this one is a masterpiece. Wear it in goid health! Are there any plans to do a review on your finished CdL suit? It’s not finished yet…. need to go to Paris next month. Would you ever consider a mink collar, it is that too ostentatious for you? Hi Simon, a couple of questions on design if you would be so kind; On your beautiful camel Polo coat you used patch pockets, on the Vergallo slanted pockets with a flap. Each gives a particular resonance regarding formality. I am interested in your reasons for using the post box style with flaps…given that it is possibly your most formal coat in material and design, I feel the use of this particular pocket style dilutes the formality and moves it toward more of a Great coat. A straight, flapped pocket, as in Crombie’s King coat style might have been more fitting (not that I’m asking for predictability). Not a criticism but I’m interesred in the creative process that led to this nuance. Were you wishing to take the formal edge off therefore giving it a greater range of wearability? l’d also love to see more photos with a suit etc. and would be interested in the relative warmth v. your Polo. 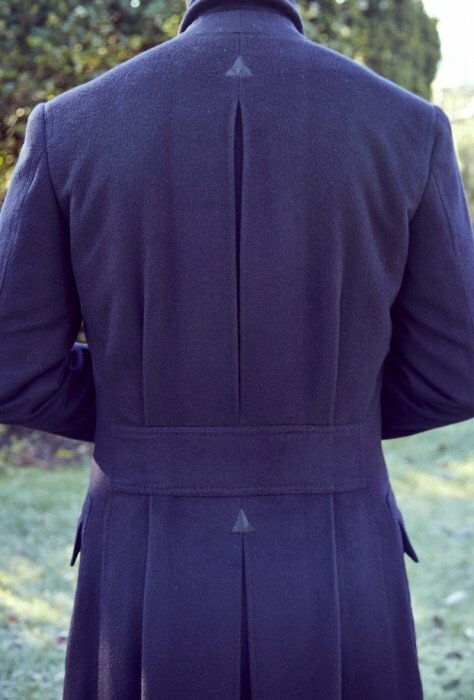 The back design is beautiful and, as with the Gieves Pea coat, takes this piece beyond tailoring and into the realms of wearable art. Although this is certainly a formal colour and material, the flatter angle of the lapels (which allows it to be fastened under the chin) makes it more akin to a sportier overcoat, such as a polo coat. This would be clearer with some shots of it with the collar down (will do that soon). Versatility was also a concern, which was one reason for the slightly shorter length. I wanted a coat that I could wear with almost anything, from casual to formal, given the quality of the make and the cloth. It had to be versatile. Beautiful coat! I love how it was designed with both function and style in mind. The back pleats and pockets are fantastic. I wish fashion designers would experiment with details like these rather than the fit and proportions of clothes. I can’t understand why coats of practical length are absent from all shops these days. Is that a choice of fashion or economics? in a post you said to not use hopsack for winter because it is a summer weave. I talked to my tailor and he said it is four season. Also, the cloth is vitale barberis canonico and it says “four seasons”. – You said hopsack is delicate and not very hard wearing. I have never owned a hopsack jacket and I’m thinking about having one made to use it as my primary jacket, so longevity it’s important for me. The jacket will also be unlined. To a certain extent it depends on the weight of the hopsack. But it is still essentially a warm-weather cloth. Hope this finds you well. Nice work on the blog — I enjoy it, and have for years. As we emerge from the rather cold winter here in NY, I’ve been pondering a question in relation to this recent post on topcoats. You commented on considerations of the sizing of a topcoat in relation to what is worn underneath — in particular that a close fit can crush the shoulders of a suit. I seem to have been a victim of enjoying a close fitting topcoat (even if same size, same maker: Richard James). Any thoughts on how best to rehabilitate the roping on the shoulder of a suit that has been badly treated? Not easy I’m afraid Eric. First step would be to have it hand-steamed and pressed. Top-end dry cleaners can sometimes do this. If there are more fundamental issues with the structure inside, it would require a tailor to work on it. Thank you Simon. I know you’ve given some guidance as to cleaners/valets in London in the past. Any insight into reliable cleaners in Manhattan? I have my own thoughts on this, but would be interested to hear yours if you have any guidance to share. Lovely coat! During the fabric selection process with Cifonelli, did you notice if Vicuna was available? If not, then could Cifonelli source this material for an overcoat? I plan to make a pure cashmere coat for myself and i am a loyal reader of your blog. In the following article, you mentioned that Cifoneli did a practical size of peak lapels for you, which makes your DB coat’s collar functional. What they did exactly？ did they make a slightly small size of the lapel or they have a total different way to design it? Wish i could get more detailed photo if you can send me. The practical nature of the lapels is that they are cut slightly flatter across the top, so that when the collar is folded up, they can sit under the chin rather than poking into it. This is not an unusual design – most great coats and polo coats used to have it, as it was so much more practical. I will try to dig up some other photos, but hopefully that gives you enough of an idea – just try folding up the collar and see how flat the lapels have to be! Thanks vm for your answer. Is it fish mouth lapel you referred to? I really appreciated if you could send me more detailed pictures of the lapel and the coat. A fabulous coat Simon, congratulations. The cloth is wonderful, would you have the specific Harrisons reference? i was wondering how the flaps of your patch pockets did make over time by now. Meaning, have the pocket openings and the pockets as a hole retained their shape? Or did they go buggy? Especially in regard of having a slit cut on the upper edge of the flaps? If i understood it right a all, that they have a slit cut. i would like to understand the make of the pockets in detail. Is it that you slide in, trough the upper edge of the flap without having to turn it up? And then reaching where with your hands? In the patch pocket or “further” inside, into the “normal” pocket construction? No, it’s a lot simpler than that. You lift up the flap in the normal way, and just have the patch pocket inside, which sits on the outside of the coat.